In case of a traumatic accident you will naturally get the consultation with your doctor after the surgery. We as Southern Prosthetics and Orthotics want to get involved in the rehabilitation process as early as possible, so that our prosthetists can answer your questions and give you an impression of what to expect during the rehabilitation process. Furthermore, we are happy to cooperate with your doctors to achieve the best possible results for you. All you have to do is to call your local Southern Prosthetics and Orthotics facility prior to the surgery and we will arrange an appointment. We know that having an amputation is a major change in your life. However, you do not have to carry this burden alone. Your treatment team consisting of your doctor, prosthetist and therapist supports you in case of occurring problems and answers all your questions. Do not feel ashamed to talk about your fears – your treatment team is skilled to handle this situation and also offers psychological counselling. The earlier you seek support, the better, since overcoming mental conflicts and fears contribute to a rapid healing and regaining your quality of life. Throughout our long history we experienced a positive impact resulting from dialogues between amputees. Talking to other amputees lets you get new insights on how other amputees deal with the situation. Moreover, you can get valuable advice on how to live with an arm prosthesis, the fitting process and how others handle their prostheses in everyday life. Your doctors, therapists and prosthetists help you to get in contact with local peer support groups. To find the best prosthetic solution for you your prosthetist will conduct a personal interview and thorough physical examination in your local Southern Prosthetics and Orthotics facility. This is where your personal needs are being determined. An initial swelling of the limb tissue after the amputation is expected. This is a normal, healthy reaction to the surgery and usually subsides after a few weeks. In the meantime, the wound needs to be dressed for your prosthetic arm fitting and the swelling needs to be reduced. This is done to prevent a pronounced residual limb oedema as it delays wound healing and it also takes longer for the residual limb to reach its final shape, so that the fitting of your arm prosthesis would be protracted. The oedema therapy and application of special creams ensure the scar tissue to remain soft and supple while simultaneously becoming resilient which is essential for wearing a prosthesis. Immediately after the surgery nursing staff will assist you to shift your position several times a day to prevent bedsores and help you to find a position free of pain. Your positioning in bed should be done in such a way that the muscles and joint closest to the residual limb do not shorten or stiffen. 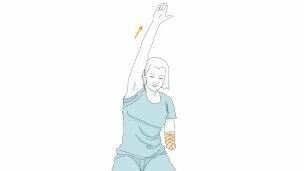 How to correctly position your residual limb will be shown to you by your doctor or therapist. Starting with the therapy is a critical step towards regaining your independency. Your team consisting of prosthetists, doctors and therapists creates a tailor-made therapy programme for you. We advise you to start therapy as soon as possible after the surgery to strengthen your muscles. This will make your time during rehabilitation much easier. Your doctor or therapist will show you therapy exercises to optimally prepare you for your prosthetic fitting. The muscular training functions as a preparation for your muscles to wear an arm prosthesis. The amputation of an arm causes a loss of weight on the amputated side which can lead to imbalance and poor posture. It is important to pay special attention to keeping your torso in balance and maintaining a healthy back. Keeping that in mind special exercises can help to prevent the development of any malposition. To maintain the flexibility of your remaining joints the residual limb should also be included in the training. Your therapist will show you the exact exercises to train your torso, back, shoulder and residual limb. Your active participation is crucial for a successful fitting. Training of the sound side follows, depending on whether your dominant hand or the opposite hand was affected. Fine motor skills, dexterity and strength training will be practised. The more capable you are with your sound hand, the better you’ll be able to perform activities of daily living and take care of yourself. It’s important to practise challenging activities such as writing or brushing your teeth early on. Your prosthetist at Southern Prosthetics and Orthotics considers all the factors that influence the selection of a suitable arm prosthesis for you. These include your physical condition and health, the amputation level, your motivation and the demands you place on the prosthesis as well as your professional and private environment. The options offered to you by Southern Prosthetics and Orthotics modern prostheses meet all the requirements of daily life. Your prosthetist helps you to choose the best prosthetic components individually for you. Generally your arm prosthesis fulfils the function of restoring your quality of life, preventing posture problems as well as balance impairments and helps to avoid excessive strain of your sound arm. For us at Southern Prosthetics and Orthotics regaining your mobility means you can rely on the support of your arm prosthesis in all your daily activities. You need to be able to control the prosthesis during each movement phase to fully benefit from its functions and to enjoy smooth movement patterns. Therefore, the component connecting your residual limb with the arm prosthesis, known as a socket, needs to fit you perfectly. This is why we use full-contact sockets that give you more control and result in a better functioning of the whole prosthesis. To ensure the correct fit of the socket as well as the whole arm prosthesis it is essential to take detailed measurements of your residual limb and body. Depending on the condition of your residual limb we employ digitally based methods or use plaster cast to take your individual body measures as precisely as possible. Using your individual measurements your prosthetist produces a one-to-one model of your residual limb which is the basis for manufacturing a thermoplastic interim socket. After having determined all prosthetic components your prosthetist assembles a complete artificial arm and aligns it accordingly. Your prosthetist will decide whether an interim arm prosthesis is necessary in your case based on your individual needs, wishes and the condition of your residual limb. Due to the fact, that the interim socket, also called test socket is made from a thermoplastic material it allows your prosthetist to react to volume fluctuations in your residual limb and to make sure the socket is perfectly comfortable for you. 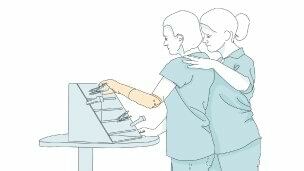 You will wear the interim prosthesis for early training exercises such as opening and closing your hand. 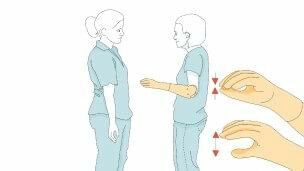 The interim prosthesis consists of all the parts that your final arm prosthesis comprises of – the prosthetic hand, the wrist joint, the elbow joint where applicable and the socket. You may need to visit your local Southern Prosthetics and Orthotics facility several times for adjustments to be implemented. We know that this might be perceived as a tedious process, nevertheless be patient in this stage of your fitting as it determines the perfect fit of your final arm prosthesis. After no more volume fluctuations occur in your residual limb the suitability of the prosthetic components as well as your interim socket is evaluated. When everything is to your satisfaction your final arm prosthesis will be manufactured. When a comfortable fit of your socket has been achieved after several trial fittings and all prosthetic components have been selected carefully your final arm prosthesis can be assembled. The prosthetic alignment process can vary from patient to patient depending on your body posture and physique. Be assured that your prosthetist advises you on the best prosthetic solution for you. Once your final arm prosthesis is ready additional trial fittings with your prosthetist follow to check the prosthetic alignment and to precisely adapt the prosthesis to your needs. At this stage your prosthesis can also be equipped with a custom-made aesthetic cover. To ensure an optimal synergy between the prosthetic technology used and our therapeutic expertise a therapist will accompany you during your rehabilitation process in your Southern Prosthetics and Orthotics Centre. 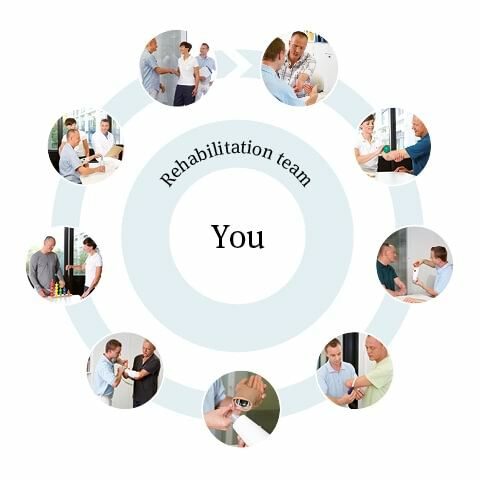 Nevertheless, most of your rehabilitation programme will take place in a specialised clinic. Therefore, we would like to have as much contact with the clinic as possible to support you during your rehabilitation. The purpose of your rehabilitation is for you to train wearing your arm prosthesis with the ultimate goal to provide you with maximum independence and quality of life. The starting point of your rehabilitation training depends on the condition of your residual limb. The rehabilitation phase begins when the wound on your residual limb has healed properly which can take up to 6 months after the amputation. Depending on your individual circumstances the training will be done with your interim or final arm prosthesis. You can directly influence the success of your rehabilitation through active participation as well as high levels of motivation and self-confidence. During rehabilitation you learn how to care for your residual limb and scar yourself. Your therapists will guide you and provide you with valuable advice. To prevent rough and scaly skin you should wash your limb with mild soap twice a day. The skin should then be dabbed dry thoroughly and a special cream should be applied that is designed to care for highly stressed skin. We recommend you to use Derma Prevent and Derma Repair to avoid chafing of the skin and to keep it soft and supple. 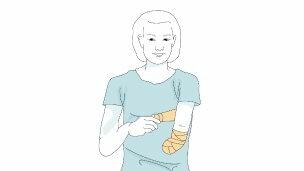 Putting on your arm prosthesis right after washing your limb might be a bit difficult since warm water causes the limb to swell slightly. In order to prevent infections you should pay special attention to folds of your skin and scar contractions. Look out for skin injuries, pressure points and blisters which require medical treatment. To see the back side of your residual limb more comfortably you can make use of a mirror. The flexibility of the scar can be enhanced by gently stretching and massaging it. Clean the inside of the socket with a moist cloth to remove sweat residue and skin particles daily. This helps you to avoid skin irritation. If you wear a liner, please care for it daily according to the user manual. Finally, if you have a myoelectric system, you’ll likely have to charge the batteries on a daily basis. 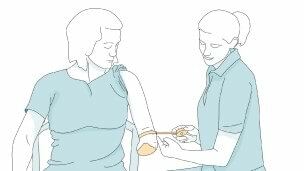 During rehabilitation you will also learn how to correctly put your arm prosthesis on (donning) and take it off (doffing). There are various ways to don a prosthesis depending on the prosthesis itself and on the characteristics of your residual limb. Taking your individual circumstance into consideration your therapist will show you the best solution for you to handle your arm prosthesis confidently. Initially, your family or friends may need to help you, but the goal is for you to ultimately be able to do this on your own. The goal of rehabilitation training with a therapist is to help you gain as much mobility and independence as possible. Depending on the components used in your arm prosthesis controls training will teach you how to open and close your terminal device or hand, rotate it internally and externally and in case of higher level amputations how to flex or extend the elbow and shoulder. Think of controls training as learning about all the controls for driving a car – without really driving yet. Repetitive drills training on the other hand is where you learn to ‘drive the car’ by repeating specific movement patterns. The more you practise the better you’ll get at remaining relaxed while performing the movements and the more automated the movements will become. With enough repetition you’ll be able to simply make a movement instead of thinking about it. After the repetitive drills, you are ready for more complex movements that you’ll encounter in everyday life. Your therapist tailors the ADL training to your personal goals and needs, depending on your day-to-day life and occupation. You begin with simpler activities such as folding a towel, and then work your way up to things such as preparing a complete meal and eating it with a knife and fork. ADL training also includes getting dressed and undressed, opening a bottle and pouring a drink as well as using a computer and office tools. If you experience difficulties with your new arm prosthesis while performing certain activities, various assistive devices may be used to increase your independence. Your therapist can determine whether this is an option for you. However, the less is more rule applies to all devices. The fewer devices you need, the greater your day-to-day independence. If you use many specialized devices in your home environment, it will be more difficult to handle situations outside your home without those devices. A team consisting of your therapist, prosthetist and ideally your doctor will finally approve your arm prosthesis implementing final adjustments and recording your progress. 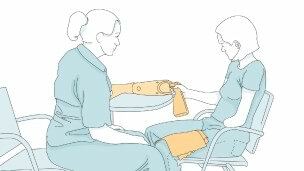 Before you leave you will be handed a treatment outcome report for your documentation as well as a user manual for your prosthesis including all important information on how to use your arm prosthesis in everyday life. Southern Prosthetics and Orthotics regards itself as a long-term partner for you to master the challenges that you decide to tackle. This is why, even after your successful fitting, adjustment period and rehabilitation your local Southern Prosthetics and Orthotics Centre still remains in contact with you. We recommend you to visit us for regular check-ups so we can determine if adjustments need to be made and can implement these. Please feel free to get in touch with us in case you have questions or queries of any kind.